(ISNS) -- A group of physicists and biologists has developed a nanotechnology-based technique that promises to increase the speed and sensitivity of diagnosing Lyme disease, a bacterial condition that infects more than 30,000 Americans each year. The method, still in the research stage, uses nanotubes – tiny threads of carbon barely visible to the human eye – attached to antibodies that react with particular proteins carried by the bacteria responsible for the disease. An illustration of a Lyme antibody attached to a carbon nanotube. "We're looking directly for the Lyme organisms," said physicist A. T. Charlie Johnson, who led the multidisciplinary group at the University of Pennsylvania with bacteriologist Dustin Brisson. "This could be very useful in detecting early-stage infection." In general, earlier treatment, typically with antibiotics, produces better results. "Treatment is likely to be complicated if you don't catch it early on," said Paul Lantos, M.D., a specialist in Lyme disease at Duke University. Currently used blood tests catch Lyme disease in later stages, because they detect an infected person's antibodies in response to Lyme bacteria. The new test directly identifies the Lyme bacteria proteins, known as antigens because they are the actual substances that trigger the immune response. The research "shows the basic premise that one can detect an antigen effectively," said Tarek Fahmy, professor of chemical engineering and biomedical engineering at Yale University, who did not take part in the research. However, Fahmy cautioned that full diagnosis depends on other factors. These include the eventual production of antibodies to the disease. First identified in the mid-1970s in the Connecticut towns of Lyme and Old Lyme, the disease is spread to humans by ticks that have fed on deer or other animals. Left undiagnosed and untreated, the disease can cause intermittent arthritis and neurological problems. In areas such as the northeastern United States where the disease is common, a bull's-eye-shaped pattern at the site of the tick bite is often sufficient to diagnose it. "But in places where the disease is less common, it is sometimes useful to have a test to check whether what you're seeing is Lyme disease or not," Lantos said. The Centers for Disease Control and Prevention recommend a two-step procedure to test the blood for Lyme disease. First comes a test known as ELISA, which can indicate the presence of antibodies to Lyme and similar bacteria. If this is positive or questionable, clinicians apply a Western blot test, which focuses on detecting specific antibodies to the Lyme bacteria. This process has two disadvantages. Since the body takes time to develop antibodies to combat the bacteria, it fails to diagnose the disease for several days or even weeks after the initial infection. And it can't distinguish between antibodies caused by an old, treated infection and those created by a fresh exposure. "We want to look directly for infection in the current moment rather than for evidence of infection in the past," Johnson said. Team member Jennifer Dailey, an undergraduate who had suffered from Lyme disease, inspired the project. She put Johnson in touch with Brisson, the bacteriologist, who suggested detecting the Lyme bacteria directly, using carbon nanotubes adapted into sensors. The researchers needed two steps to create the sensors. First, they used the nanotubes to make tiny electronic devices known as field-effect transistors. That involved growing the nanotubes on the silicon wafers routinely used to produce computer chips. Then, Johnson said, "we created a covalent bond between the nanotubes and the antibodies." Covalent bonds allow different molecules to link up tightly with each other by sharing electrons. Johnson's team applied a chemical process that gave them "quite a bit of control" over the bonding, he explained. 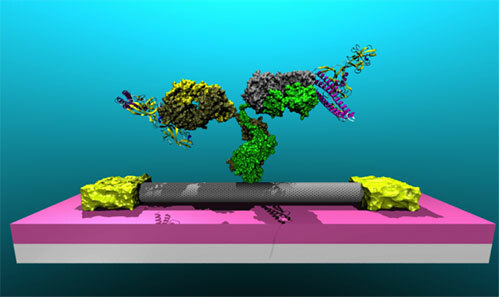 The researchers used an ultra-sensitive microscope to confirm that the nanotubes and antibodies had joined together. Whenever an antibody linked up with a Lyme bacterium's protein, it changed the electrical properties of the nanotubes to which they were attached. The team measured the electrical activity of the tiny transistor devices after removing them from the solutions. "The more protein there was in the solution, the bigger was the change in the electrical signal," Brisson said. The studies revealed that the method's sensitivity at least equals that achieved with the current ELISA test. "It is more than sufficient to detect the Lyme disease bacterium in the blood of recently infected patients and may be sufficient to detect the bacterium in fluids of patients who have received inadequate treatment," Brisson said. To reach that stage, the team is adapting its technology to detect Lyme bacteria in natural samples such as human blood. According to Johnson, several commercial firms have already expressed interest in joining the effort and taking the method through animal tests and clinical trials involving humans. He added that the technology of "nano-enabled diagnostics" has application beyond Lyme disease, "to any ailment for which we can come up with an antibody, or even engineer an antibody," Johnson said. The team reports its development in the July 13 issue of the publication Biosensors and Bioelectronics.